Mushroom-Bacon Risotto. What more risotto recipes? Check out the Wall Street Journal story below. Thrillist: "10 Little-Known Historical Facts About American Chinese Food," by Adam Lapetina. In case you haven't heard, the Chinese food you generally get at Chinese restaurants in the U.S. isn't authentic. It's an Americanized version of the cuisine adapted to the tastes and availability of ingredients of this country. It's also been around along time now, having developed its own history, which Lapetina wonderfully describes in this article. The U.S. has a long history of adapting foreign cuisine to suit our tastes, hence things like New York- and Chicago-style pizza and Tex-Mex (fajitas!). Table Matters: "Cold Fusion - Westernized Korean food: the next experiment in Asian fusion," by Shelby Vittek. By now, everyone knows the Korean taco (which I enjoy frequently from TaKorean), but isn't it time for other dishes to get a Korean makeover? Vittek reports on a Korean cooking class whose last assignment was just that: put a Korean spin on a classic western dish. The results like Bulgogi Cheesesteak and Korean Spaghetti Bolognese sound perfect. Plus, I love the quote from the Drexel University Hospital and Tourism program director declaring Korean cuisine "the next big thing," since I declared as much in my In/Out for 2014 list a couple weeks ago. Washington Post: "Superfoods in play: We challenge chefs to design recipes using nutritious ingredients," by Bonnie S. Benwick. This is the first in a series of articles where the Post gets local chefs to come up with healthful dishes for home cooks featuring ingredients from the Post's list of "superfoods." Old Angler's Inn Chef Nick Palermo tackles the challenge first, coming up with recipes for turkey and avocado (his Pan-Seared Pork Chops With Roasted Avocado, Broccoli and Sherry Vinaigrette sounds amazing). Washington Post: "Gin goes dark: At what point does aging render it unrecognizable?," by M. Carrie Allan. In yet another fine example of how Spirits columnist Carrie Allan and I tend to be on the same booze wavelength: one day after I buy my first bottle of barrel-aged gin, she's written an article about it. Her article raises the interesting question about whether aging gins in this manner makes them lose their "ginniness,"a term attributed to Beefeater master distiller Desmond Payne. Wall Street Journal: "Doing Right by Risotto," by Aleksandra Crapanzano. Risotto is a dish I absolutely adore. 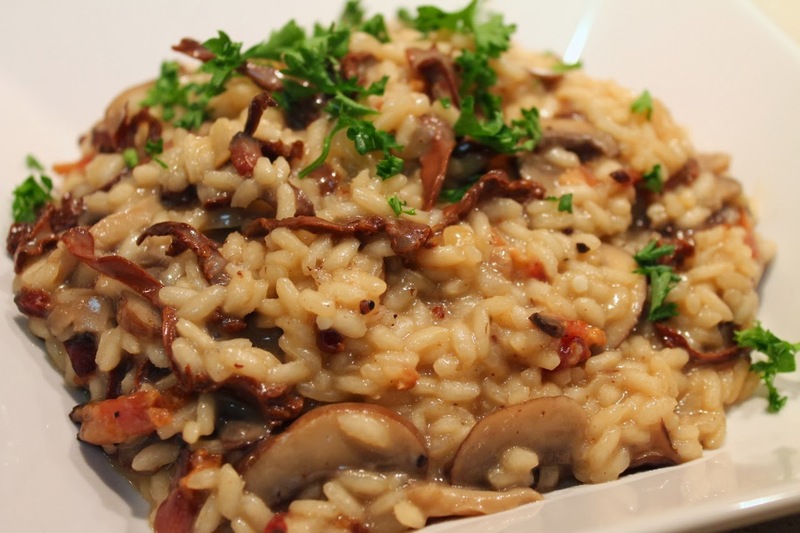 Crapanzano's article on the Italian rice dish includes four interesting and varied recipes and some great tidbits, like that a lot of Italians skip the long stirring and make their risotto in a pressure cooker (which I've tried, it worked great). Los Angeles Times: "Butter consumption in U.S. hits 40-year high," by David Pierson. Counterintuitively, Pierson writes that "America's health fixation has been a boon for butter." Why, you ask? Because consumers seeking natural alternatives to hydrogenated vegetable products are more and more using the creamy, fatty spread for their cooking. Seriously, does anyone eat margarine anymore? Other than a vegan variety, I haven't had it in decades. Since I declared this Winter Soup Week, here's a gallery of Asian noodle soups and recipes from Saveur. I'll have my own coming later this week. Huffington Post: "International Foods That Are Hard To Find, From Fish Sperm To Duck Embryos," by Alison Spiegel. "To each his own," you might conclude, after perusing this gallery of hard-to-find (in the U.S., at least) foods, some of which sound, well, kind of nasty. I'm eager to try some dark gin and I'll give Korean a try too. Think I'll pass on fish sperm and duck embryos.